Using the SharePoint Online Content Type Hub | Where have the days gone? This article walks you through using the SharePoint Online Content Type Hub to create and publish a content type for use throughout your tenant. This gives you a consistent structure for items of a specific type. You can learn more in general about content types in this Microsoft article. Once you’re in the Content Type Hub, if you go to Site Settings > Site Collection Features, you’ll see that the “Content Type Syndication Hub” feature is already activated for this URL (unlike SharePoint on-premises). You also don’t need to go to the Managed Metadata Service in the Tenant Administration area, to add the Content Type Hub URL or to configure the consumption of Content Types from the hub – this is already done for you. 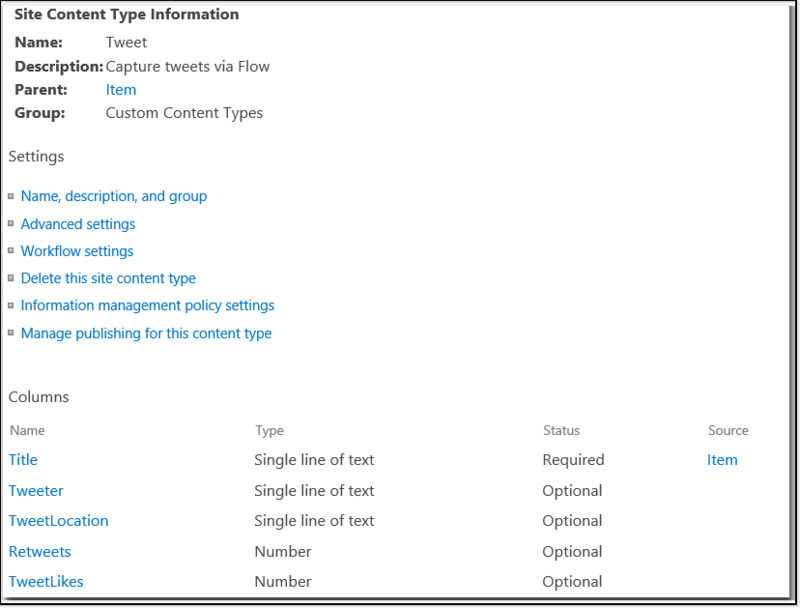 In this walkthrough, I’ll create and publish a custom content type to store Tweet data in custom lists via Microsoft Flow (which I’ll walk through in an upcoming post). 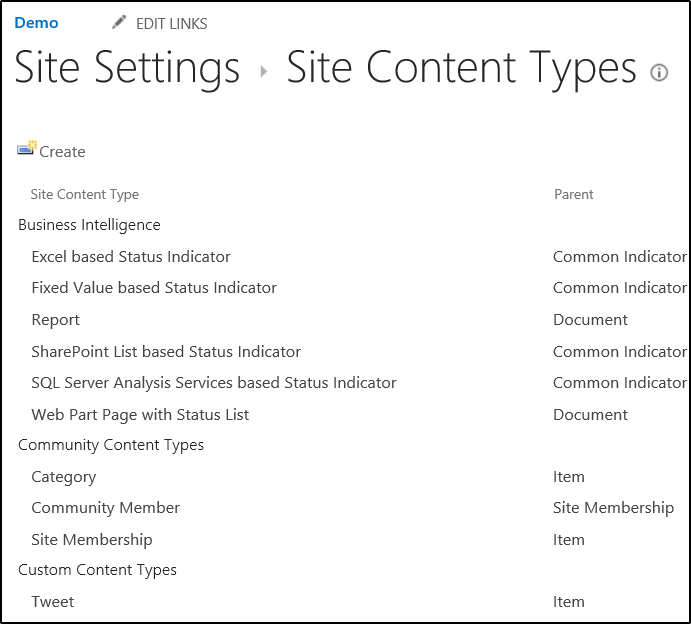 To create a new content type in the Content Type Hub Site Collection, go to Site Settings > Site Content Types > Create. Below, I’ve created a Tweet content type in the Custom Content Types group (based on the Item content type) within the Content Type Hub Site Collection. I want to be able to use this content type in a number of lists throughout my SharePoint Online tenant, so I need to publish it. On the settings page for the new Content Type, click on Manage publishing for this content type. As it’s a new Content Type which hasn’t yet been published, the Publish option is already selected (and you can’t change it), so click OK. If I make changes to this content type later, this is where I would republish it. Next, go to the Site Collection Administration on a Site Collection where you wish to use the new Content Type (Site Settings > [Site Collection Administration] Content Type Publishing), and enable the checkbox to “Refresh all published content types on next update”. Click OK. I can now (for example), create a custom list for tweets about a specific event, enable management of content types on that list (under Advanced Settings), and use my Tweet content type. I can do this on multiple lists, and have a consistent structure for each list, which will allow me to use a consistent Flow, and to be able to successfully aggregate the lists if I wish. NOTE: The behavior and screenshots documented in this post were current as of November 2016, and with the addition of my January 2017 and March 2018 updates. Things may be different at a later date. This is a great write up and the most put together information on this topic, IMO. Thanks for knocking this out of the park! I was receiving an access error while trying to refresh my content types in a SP Online Group. This link helped me get through that. Posting here to hopefully help anyone else in need!